Amazon organizes Amazon Quiz daily from 8AM – 12PM and offers huge prizes everyday. By just answering 5 simple question, you can stand a chance to win that prize. In today’s Amazon Quiz, you can win a Samsung Galaxy S10e. The phone is currently priced at around Rs 55900 on Amazon. With great design, this phone also has 2220 x 1080 pixels resolution. Exynos 9820 octa core processor is the processor that is used by Samsung. It’s a really good high end smartphone. So, don’t miss out on this chance. 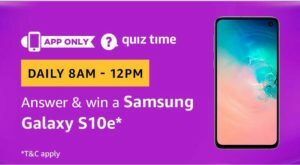 How to Answer and win a Samsung Galaxy S10e? Q5. When Discussing Terms Related To Water, Nimbus, Cumulus And Stratus Refer To Types Of _______. Results on 30th April 2019.